The planet Mars might initially seem an odd choice for Place of the Year. It has hardly any atmosphere and is more or less geologically inactive, meaning that it has remained essentially unchanged for millions of years. 2012 isn’t much different from one million BC as far as Mars is concerned. However, here on Earth, 2012 has been a notable year for the Red Planet. Although no human has (yet?) visited Mars, our robot representatives have, and for the last year or so the Curiosity rover has been beaming back intimate photographs of the planet (and itself). (It’s also been narrating its adventures on Twitter.) As a result of this, Mars has perhaps become less of an object and more of a place (one that can be explored on Google Maps, albeit without the Street View facility). Our changing relationship with Mars over time is shown in the development of its related words. Although modern readers will probably associate the word ‘Mars’ most readily with the planet (or perhaps the chocolate bar, if your primary concerns are more earthbound), the planet itself takes its name from Mars, the Roman god of war. 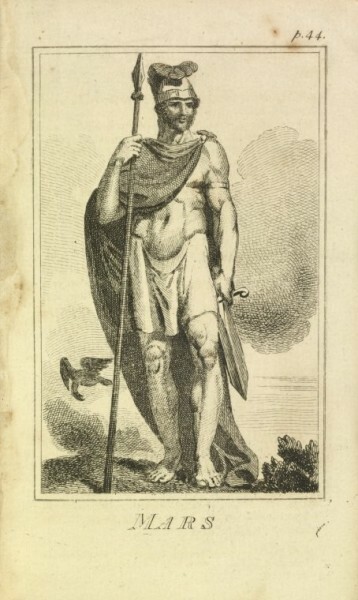 Drawing of Mars from the 1810 text, “The pantheon: or Ancient history of the gods of Greece and Rome. Intended to facilitate the understanding of the classical authors, and of poets in general. For the use of schools, and young persons of both sexes” by Edward Baldwin, Esq. Image courtesy the New York Public Library. From the name of this god we also get the word martial (relating to fighting or war), and the name of the month of March, which occurs at a time of a year at which many festivals in honour of Mars were held, probably because spring represented the beginning of the military campaign season. Of course, nobody believes in the Roman gods anymore, so confusion between the planet and deity is limited. In the time of the Romans, the planet Mars was nothing more than a bright point in the sky (albeit one that took a curious wandering path in comparison to the fixed stars). But as observing technology improved over centuries, and Mars’s status as our nearest neighbour in the solar system became clear, speculation on its potential residents increased. But in the late 19th century, as observations of the surface of the planet increased in resolution, the idea of an present of formed intelligent civilization on Mars took hold, and another sense of martian came into use, denoting its (real or imagined) inhabitants. These were thought by some to be responsible for the ‘canals’ that they discerned on Mars’s surface (these later proved to be nothing more than an optical illusion). As well as (more or less) scientific speculation, Martians also became a mainstay of science fiction, the earth-invaders of H.G. Wells’s The War of the Worlds (1898) being probably the most famous example. A century on, robotic explorers such as the Viking probes and the aforementioned Curiosity have shown Mars to be an inhospitable, arid place, unlikely to harbour any advanced alien societies. Instead, our best hope for the existence of any real Martians is in the form of microbes, evidence for which Curiosity may yet uncover. If no such evidence of life is found, perhaps the real Martians will be future human settlers. Despite the success of Martian exploration using robots proxies, the idea of humans visiting or settling Mars is still a romantic and tempting one, despite the many difficulties this would involve. Just this year, it was reported that Elon Musk, one of the co-founders of PayPal, wishes to establish a colony of 80,000 people on the planet. The Greek equivalent of the Roman god Mars is Ares; as such, the prefix areo- is sometimes used to form words relating to the planet. Perhaps, then, if travel to Mars becomes a reality, we’ll begin to talk about the brave areonauts making this tough and unforgiving journey. Richard Holden is an editor of science words for the Oxford English Dictionary, and an online editor for Oxford Dictionaries. The Oxford English Dictionary (OED) is widely regarded as the accepted authority on the English language. It is an unsurpassed guide to the meaning, history, and pronunciation of 600,000 words — past and present — from across the English-speaking world. Most UK public libraries offer free access to OED Online from your home computer using just your library card number. If you are in the US, why not give the gift of language to a loved-one this holiday season? 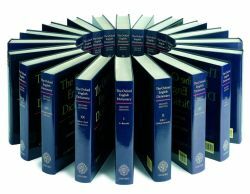 We’re offering a 20% discount on all new gift subscriptions to the OED to all customers residing in the Americas. Oxford University Press’ annual Place of the Year, celebrating geographically interesting and inspiring places, coincides with its publication of Atlas of the World — the only atlas published annually — now in its 19th Edition. The Nineteenth Edition includes new census information, dozens of city maps, gorgeous satellite images of Earth, and a geographical glossary, once again offering exceptional value at a reasonable price. Read previous blog posts in our Place of the Year series.